Lecturers at the University of Liverpool have launched a new partnership with educational physical theatre company, ActREAL, to bring a different dimension to their teaching. Founded three years ago, the organisation offers a new and innovative learning experience to schools, colleges and universities across the country. Students are encouraged to take part in a range of activities, from interactive games to role play, that encourage them to put themselves in the shoes of others when learning about world affairs and social issues. 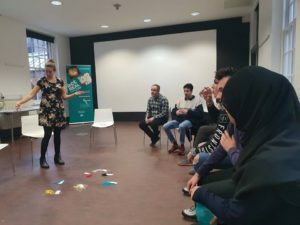 The first session was held at the Bluecoat centre in Liverpool One this week, focusing on the mental and physical health of asylum seekers and refugees who have come to the UK. A group of 20 students studying either Sociology or Criminology attended for three-hour session which had them up on their feet taking part in activities including a mock court case that gave points of view from a man at risk of deportation, a witness, the Home Office, and defence lawyers. They were also asked to present the story of a refugee who had lost his entire family on his journey to Europe in any medium they felt expressed them the best. 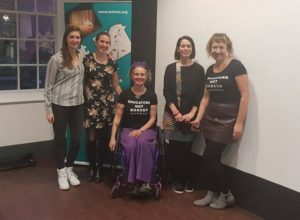 Criminology lecturer, Dr Emily Hart, said: “We began working with ActREAL following a project myself and two of my colleagues started when trying to introduce different learning methods into the classroom. “We wanted to start bridging some of the new modules that have been introduced this year together and really bring lots of different elements of them into one workshop. ActREAL tailors each of its workshops to the client’s requests and the flexible nature of the business model makes it relevant for all subject areas. Creative Director, Ida Persson, said: “ActREAL is a social enterprise that uses theatre-based activities and performances to encourage fun and innovative ways of communicating academic research to community groups, schools and universities.